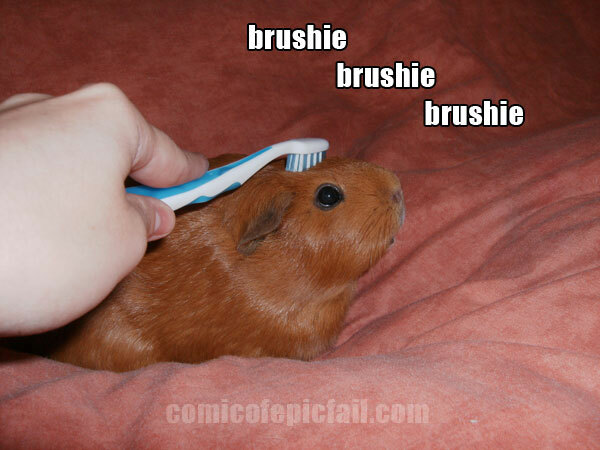 This is my additition to the brushie brushie brushie meme which started with a bat having it’s head brushed by a blue toothbrush (so cute) and spiraled into a series of images using the same motif created by different people. Thus we have been brought such delightful imagry as Picard transported from dispair to delight by the miraculous blue toothbrush. It even got made into a comic strip! Well, I just had to find out if a blue toothbrush really had that effect, so using scientific method, I tested* it on a Guinea Pig. She seemed to like it. Mind you she does like strokes on the head best.